The rollercoaster ride of the election campaign is drawing to a close but, as broadcaster Peter McHugh writes for Channel 4 News, Gordon Brown's time ran out long before he announced the election date. 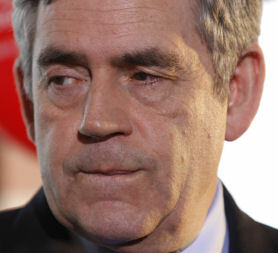 You can say what you like about Gordon Brown, and most people have, but you cannot accuse him of being a coward. And that's the problem. Gordon has spent the last three weeks, indeed the last three years thinking that politics is about telling the people that they have choices to make about policies. "People don't want to elect a TV personality" he said at the weekend and that sadly is where he has got it wrong. Gordon is a politician of the last century. A face made for radio, a brooding Presbyterian from North of the border, a man steeped in Labour history. All of which was perfect for those days of left versus right. But sadly for Gordon his chances did not run out three weeks ago, when the campaign got going, nor even last week in Rochdale, but 13 years ago when Teflon Tony took him for lunch and persuaded him that he, not the son of the manse, should lead the Labour party. At one fell swoop Tony launched the new politics that had to have the new leader that Gordon could never ever become. So, here we are just two days before polling day with the wounded Scottish bruiser still on his feet swinging punches at shadows. You could tell he was lost when even his enemies started paying him compliments. Decent, hard-working, and caring, just a few of the words to describe someone they knew was finished. Had it all seemed so different at the start of the election campaign? Well, absolutely not. We quickly forget that just three weeks ago David Cameron, the Tony Blair of the Conservative Party, was nine share points ahead of Labour in the opinion polls and that was the mountain that Gordon had to climb. An impossible task, even then. Little did he know that Dave's little brother Nick, the Tony Blair of the Liberal party was also going to get a go? Gordon said it all without knowing it, when in the sequel to Debate One, the movie, he described Nick and Dave as being his two sons squabbling at bath-time. The public had already spotted that the Dad's time had gone and it was time for one of his lads to be given his chance. Sadly Gordon, people did want a TV personality. The decision to stage the leadership debates on TV and to allow the Lib Dems an equal chance guaranteed that what Gordon hoped would be a campaign on policy would never happen. Television is a medium of make-up and make-believe, providing the smoke and mirrors that its critics so often accuse it of. The reports of debate one read like theatrical reviews. Nick's insouciance casting him as the noisy but keen young Lothario, Dave's nervousness at suddenly usurped from his expected role as the new leading man, Nick's sudden self-confidence and then Gordon, apparently appearing in the wrong play. Ten million people had turned up for this first night. And they knew what they thought even before they left the theatre. An instant opinion poll revealed that the youngest of the young pretenders, nice little Nick had gone from zero to hero in 90 minutes. Dave and his mates were left flustered and Gordon was just left behind. And so it stayed through Debate Two. What went on between the television appearances was an irrelevance. As television proudly claimed its new place in the election campaign and said politics had been reinvigorated, the audience for other more traditional political outlets like the news, Panorama and Newsnight, fell away. The polls hardly changed. Was Dave in the lead, or was Nick? One thing was certain throughout - it was never Gordon. He said that "with all this personality stuff the message gets squeezed out" and he was dead right. So, what did we learn in the three weeks? We learnt that the Tories were going to give a lot of very rich people even more money by raising the limit on inheritance tax. We learnt the Lib Dems wanted to scrap Trident but actually they didn't really. And we learnt that all three at least agreed on one thing, there was no way that any of them was going to admit just how much effluent was going to be poured on our heads to get us out of our massive financial black hole. And so, the campaign trundled on. Dave and Nick, terribly well brought up, terribly smart and terribly well spoken, unencumbered with ever being in power before, able to promise almost anything without fear of being found out. And then there was Gordon, 13 years of guilt behind him, a million projects, schemes, initiatives, and fresh starts stuffed in his pockets asking for a chance to do them all again. Meanwhile, it was headless chicken time in Fleet Street. Print journalists discovered that the campaign was not theirs to invent anymore and that television was claiming it could talk to the voters direct. But then The Street Of Shame Realised that they were there to interpret television on behalf of the many more millions who chose Coronation Street and Outnumbered not to mention Fulham in the Europa Cup over the Clash of Political Titans, Acts I, II and III. That realisation returned a sense of normality to the great occasion. The Sun, The Mail and The Express could declare Cameron a winner every morning whatever he did during the campaign. They could expose Nice Nick as Nasty Nick, the atheist Nazi liberal who's family were even richer than Dave's and the whole world apart from the Daily Mirror could keep reminding us what a loser Gordon was. Having sadly been unable to get his two errant boys to stop playing around in the bath and instead concentrate on their homework, Gordon decided on a day-trip to Rochdale. As his campaign had waxed and waned he had tried to summon the ghosts of happier times. Peter Mandelson and Alastair Campbell. After all, he mused, these were the two who put Tony on top of the world. Of course, they had also been the two who had shafted him. But Gordon decided to put that behind him. They were among the advisors who said that he should get out more. "Engage" with the people and meet the voters. And so he met Gillian Duffy. Mrs Duffy had only popped out for a loaf and spotting her PM decided to ask him about an issue that loomed large in Rochdale, now a shadow of it's once industrial might. "What about all these immigrants from Eastern Europe?" was her question, among others. All went swimmingly until Gordon got in his car and described Grandmother Gillian as a "bigot". What followed is now written into the pages of political history. Who will ever forget Mrs Duffy's shiny white front door and the awful sight of Gordon's rictus grin as he stood outside of it declaring he and her were new best friends. It seemed certain the voters won't. Sadly for Gordon, it did spark one of the few debates about policy that have emerged during the campaign and the one he wanted to avoid most, immigration. We learnt the Lib Dems had a not very popular policy of letting illegal immigrants, who had got away with it for 10 years, stay here legally. We already knew the Tories would send every immigrant, from certain places at least, back home before they even had a chance to change their socks. And now we knew that the Labour party did not even want to talk to its supporters about the subject in which there never were any votes. All of this on the eve of the Final Debate. Gordon was drinking in the Last Chance Saloon, on his own and even the booze had run out. And so he can be found 48 hours before the final judgment, still bobbing and weaving, still punching, and still trying to hit somebody or something. The clichés abound: when he has not got his back to the wall, he is on the ropes, one arm tied behind his back, his seconds ready to thrown the towel in. "This is going to be me fighting to the last minute and the last second of this campaign. The debates are over. Now it's decision time" so said the man who would be king but will settle for PM. As we are continuously reminded, only one poll actually counts - the one that happens on Thursday. Only then will we know if the dominance of television and its debates in the 2010 general election campaign has at least produced a bigger turnout than the derisory 61.4 per cent of 2005. Only then will we also know if the debates did really change the whole political map, turning what were once safe seats into marginals and marginals into safe. And who knows, will we even discover what only Labour activists can hope - that all the polls so far have been wrong. 48 hours is a long time in politics as Gordon discovered in just 60 seconds in Rochdale. All he can now hope is that the redoubtable Mrs Duffy has a couple of sisters out there, on the election trail, hoping to bump into Dave and Nick before the 10 o'clock news on Wednesday night.